Born in 1968. in Zrenjanin, Serbia, where he still lives and works. Serbia, Slovenia, USA, France, Czech republic, Netherlands etc. 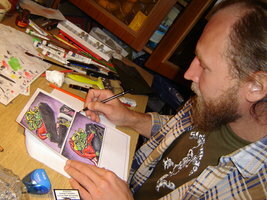 Aside from comics, he is also active in the fields of painting, illustration and cartoons.